The island of Capri, Italy, in the southern part of the Bay of Naples, is a lovely island to visit on a private yacht charter cruising itinerary. 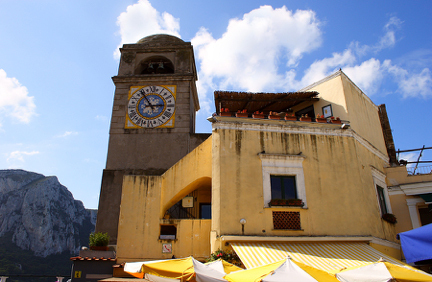 On the island there are two main towns: Capri Town and Anacapri, each of which are totally different from the other. Capri Town has two levels; a walking and shopping area right around the marina, while the main part of Capri Town, on top of the island, is accessible by funicular, and is where chic is alive and well as this part of town is filled with upscale shops and boutiques, cafes, restaurants, bars, and little piazzas, where one can sit with a drink and watch the world go by, literally, as this is where world travelers visit. 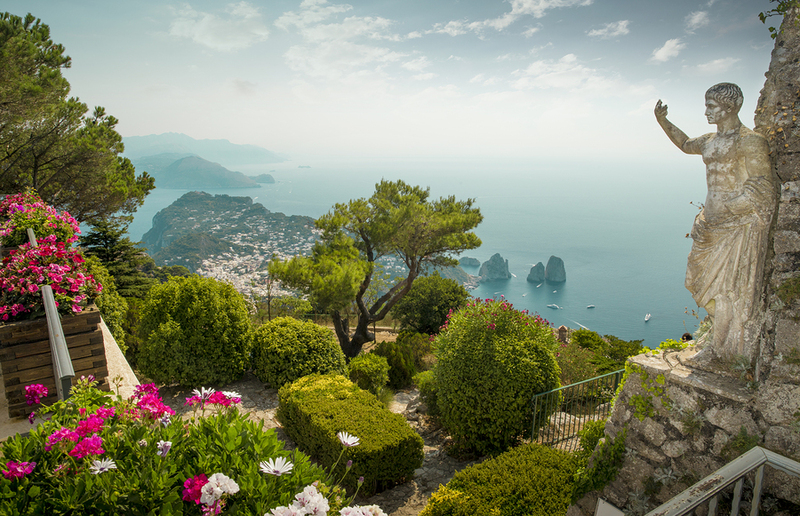 This is the jet set side of Capri, and that which this island is famous for internationally. Capri Town, on the upper level, is the place most often visited by guests on a crewed yacht charter. The main harbor of Capri, Marina Grande, on Naples Bay, is, despite the name, quite small. Dockage here must be requested well in advance and is not inexpensive. On the Tyrrhenian Sea side of the island is Marina Piccolo, which is not really a marina at all but a bay, with beach clubs, and areas for yachts to anchor. However, anchoring in this bay is very weather dependent, and cannot be expected to be a safe overnight location for any yacht. 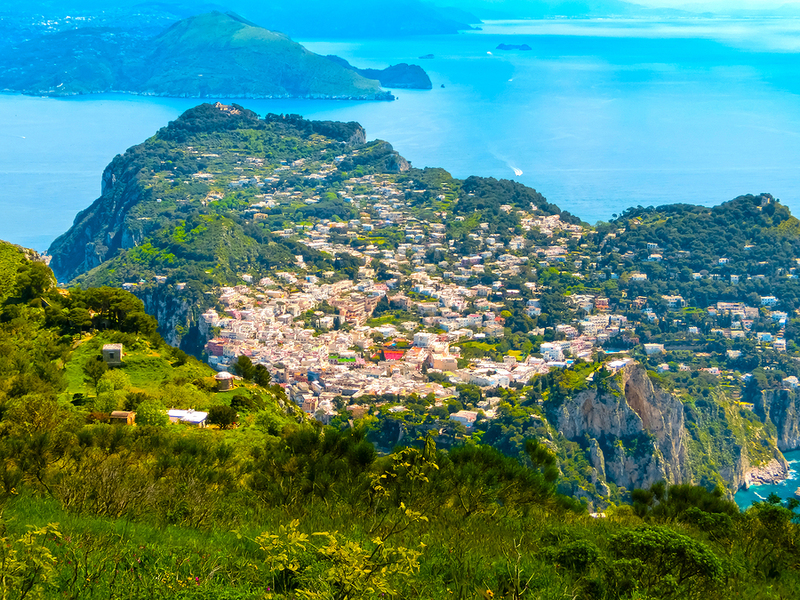 Anacapri is an inland village situated on a plateau, where the locals live, and from which there are magnificent views of the sea. Anacapri is considered the local traditional side of Capri, where life continues as always, without the chic aspect of Capri Town. 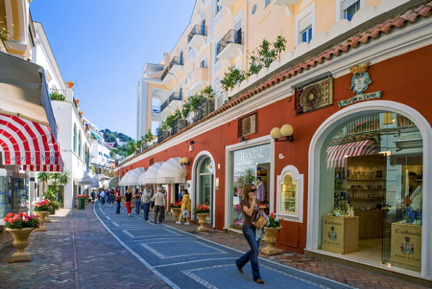 A walk around the center of Anacapri will take you past tiny Neapolitan shops for tailors, shoemakers, and the like, where the shop keepers are working at trades needed to support everyday life. Local ladies can often be found sitting outside in the shade visiting and knitting. Little vegetable plots are squeezed in between homes, and throughout the town, the scent of lemon trees permeates the air. This is a little town, considered the traditional side of the island, is best visited by land. The Blue Grotto: This is a spectacular marine grotto over 50 meters long and 30 meters wide, where the water takes on a beautiful deep blue color because of the unique reflections created by the sunlight that filters through the mouth of the cave. Visiting the Blue Grotto requires buying a ticket and joining a commercial small grotto boat with an experienced driver to take all into the grotto. No one, for safety reasons, can visit the grotto except independently. There is no swimming, as sun tan lotion can mar the surface of the water distorting the fabulous reflection of seemingly blue light for which the grotto is famous. 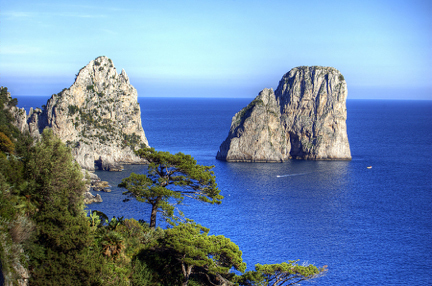 The Faraglioni: Capri’s three world famous Faraglioni (rock formations) rise, majestic and solitary, from the sea on the south-east side of the island. The largest rock, connected to the coast by a thin isthmus of land, is known as “Stella” (star) and is 109 meters high, while the other two, “Faraglione di mezzo” (middle stack) and “Scopolo” (rock), are 81 and 104 meters high respectively. The only inhabitants of the Faraglioni are a colony of blue lizards, an extremely rare variety of blue reptiles. 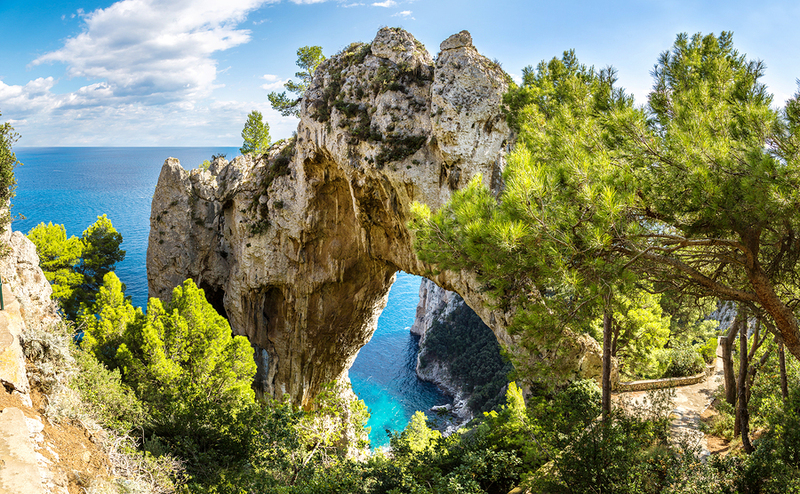 The Natural Arch: This natural arch-shaped attraction was once a cave. Its original structure changed over the centuries due to telluric movements and wind and rain erosion. 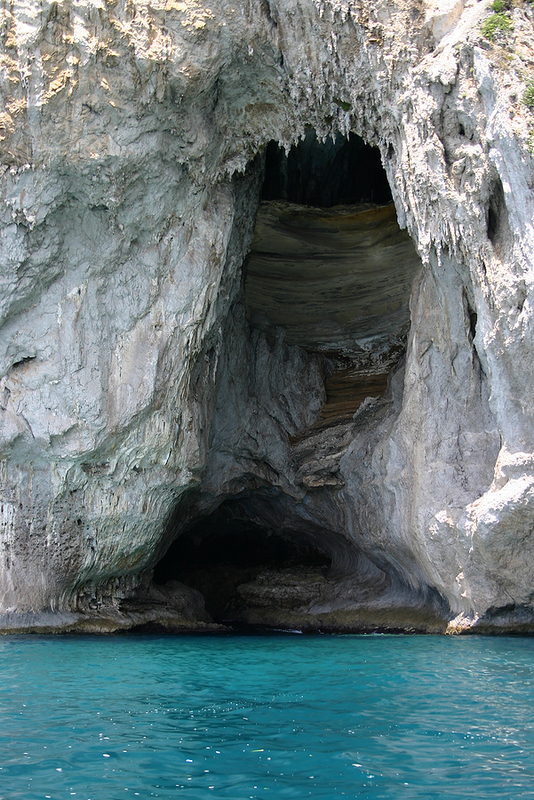 The Natural Arch is 200 meters high and stands to the east of the island, not far from the coast and its caves. Punta Carena: This spot is located at the westernmost tip of the island and is home to a lighthouse, the second most important lighthouse in Italy after that in Genoa. The jagged rocks overhanging the sea, the luxuriant Mediterranean vegetation and the lighthouse itself make Carena Point one of the most beautiful spots on the island. 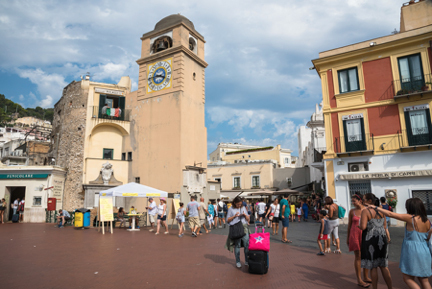 Piazza Umberto I: A setting for love affairs, betrayal, scandals and Hollywood scoops, Piazza Umberto I in Capri Main Town on the top of the island, still maintains its role as the very heart of society life on the island today. Sitting at one of the open-air cafe tables beneath the Clock Tower is a ritual in which every visitor should participate. Palazzo Cerio: Today a museum of archeological finds from excavations conducted on the island by Ignazio Cerio in the late 1800’s. These finds were organized into a museum by Edwin Cerio, his son. The exhibits include archaeological, naturalistic and paleontological collections. The museum also offers, from the terrace, excellent views of Piazza Umberto I and the seas beyond. Villa San Michele: Located in between Capri town and Anacapri, this villa is known for its’ marvelous garden, Grandi Gairdini Italiani. The Villa San Michele was built around the turn of the 19th century by the Swedish physician Axel Munthe. Enjoy the gardens, which have terrific views of Marina Grande, the Sorrento Peninsula and Mount Vesuvius. Within the gardens are many relics dating from ancient Egypt, Greece and Rome, which Munthe found on the island. The Story of San Michele, written by Munthe in the last part of the 1920’s tells the story of his finding Capri, and building the villa and gardens. The book was a worldwide best seller, still enjoyed today. Capri Island now is as well-known as it was in Ancient Times, when the island was known as a resort island for summer palaces of the wealthy. 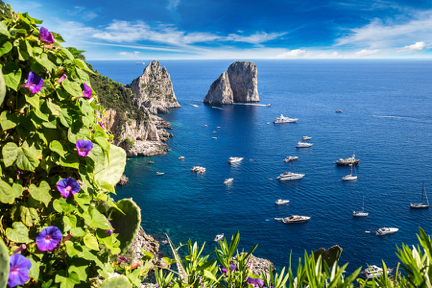 A private yacht charter out of Naples, Italy of the Amalfi Coast, is not complete without visiting Capri Island, just to the west of the tip of the Sorrento Peninsula, and mere miles from the Amalfi Coast.